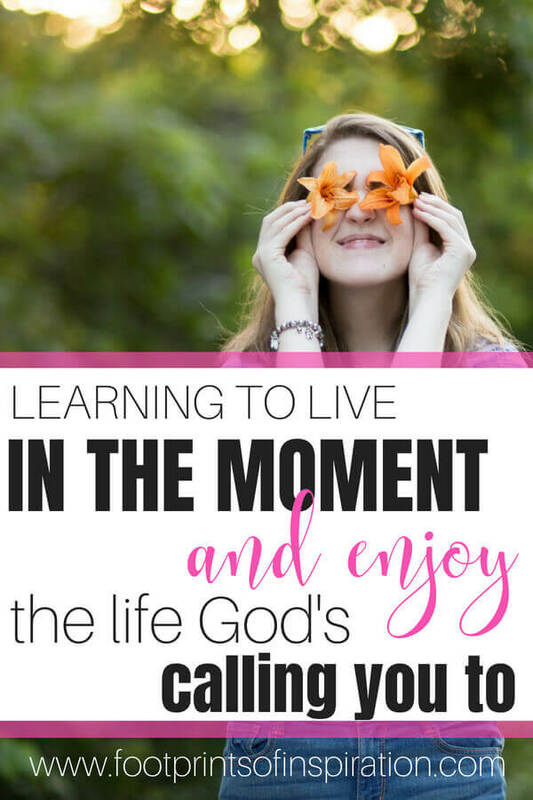 Do you struggle with living in the moment? How often do you find yourself anxious about what the future brings? Do you spend a lot of time planning out every possible scenario in your head? I’m what I would consider an obsessive planner. I absolutely love setting goals and working out how I’m going to get there. From the minute I get up in the morning, I’m running through my day, trying to determine if what I have planned is going to get me closer to my year-end goals, always trying to figure out the best strategy to accomplish my tasks so that I’m working efficiently. Although, being a goal-oriented person is definitely a strength, it can also be a huge weakness. This post may contain affiliate links. For more information, see our privacy and disclaimers here. Just recently, I was having a conversation with my oldest son who shares this same trait as me. He’s an obsessive planner too. (And possibly even more so than me.) He’ll map things out in his head, constantly making tweaks and changes to further align with the goals he has for himself. I love seeing him work through those goals and, more importantly, seeing him achieve them! I mean how many 22-year-olds have goals and work incessantly to accomplish them? 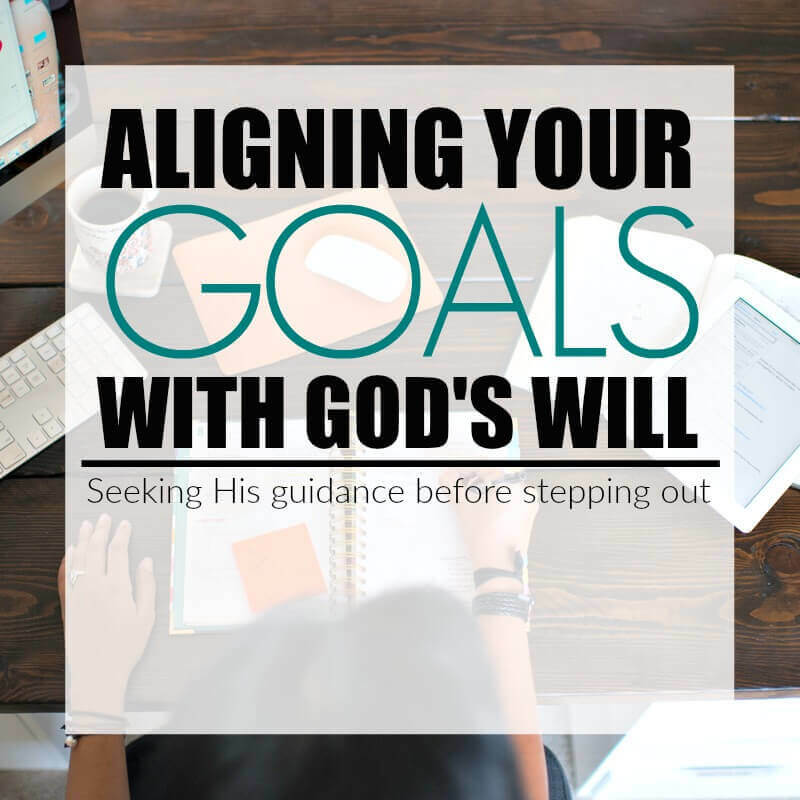 But being goal-oriented people, there’s one thing that he and I both struggle with….living with His Presence, in the present. We spend so much time planning and preparing for our future and where we will be that we forget to take a step back and enjoy what’s right in front of us. We forget to enjoy the life that’s happening right now! God expects us to plan and make a future for ourselves, but once that planning is done, He wants us to come back to the present with Him. To trust in Him to carry out those plans according to His Will, and to be able to fully enjoy this day that He’s given us. Beauty – All that God created. When we’ve got our heads down only focusing on our goals, we miss the gorgeousness that He created. The beautiful trees, the blooming flowers, the birds singing their beautiful songs. Peace – The only place that we can find real and complete peace is through Jesus. When we’re chasing after our dreams and anxious about the future, we miss out on the incredible gift of that only He can provide. 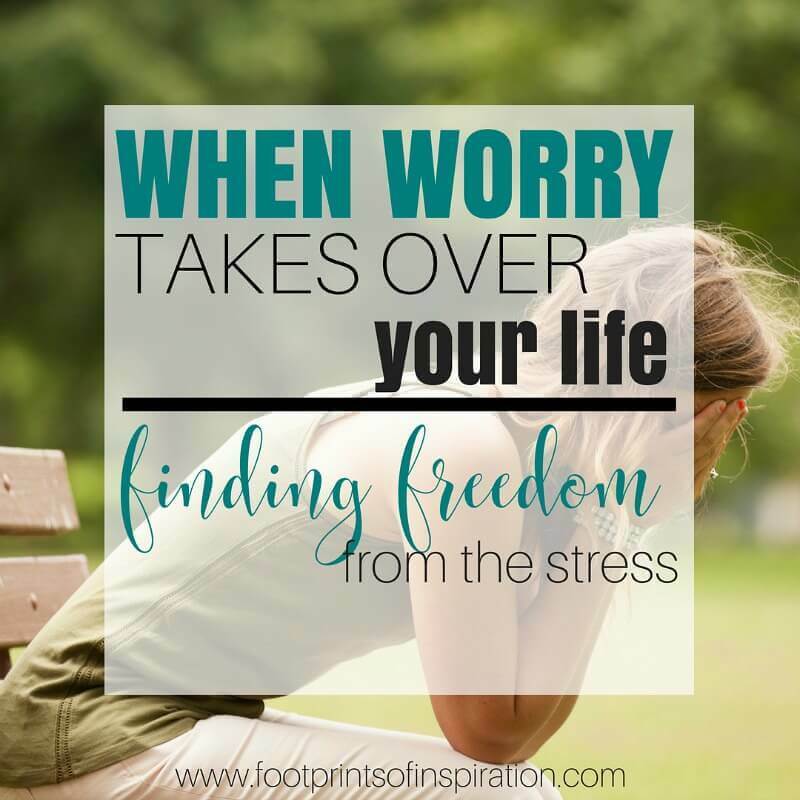 Joy – We all want joy in our life, and to feel relief from the constant stress that we go through almost daily. 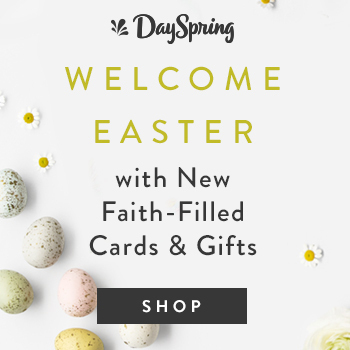 But when we’re too busy planning and looking ahead, chasing after the earthly things, we miss out on this joyful day that God has made just for us. Relationships – God has given us some incredible people in our life so that we can have fellowship and enjoy each other’s company. 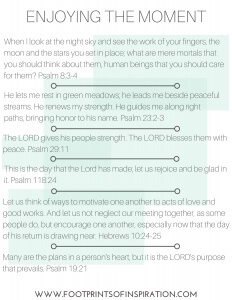 If we have our heads down, always working, then we miss out on the beautiful relationships that He has given us. Trust – Trust that God will take care of your future. 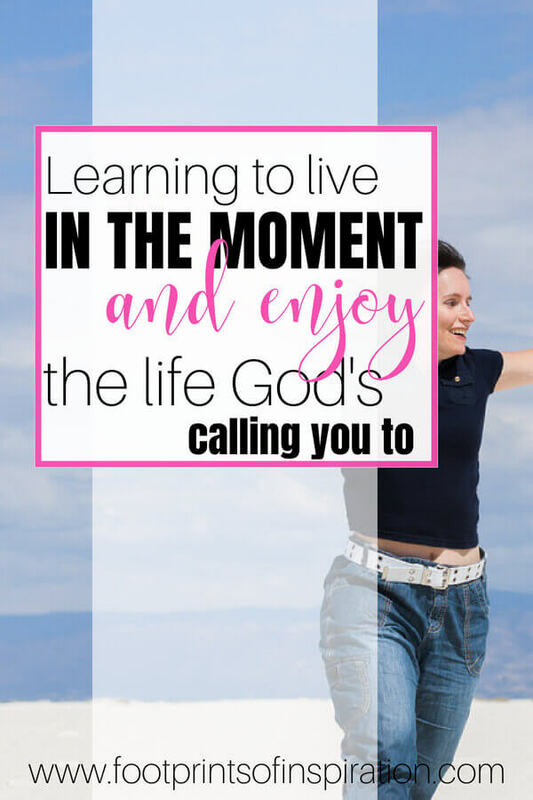 He calls us to be responsible and plan for our future, but then He expects us to come back to the moment and learn to trust that He will take care of us. So, my friend, plan away. Set your goals, put systems in place to conquer them, and then come right back to this moment. Take note of everything going on around you and enjoy this day that God created just for you! 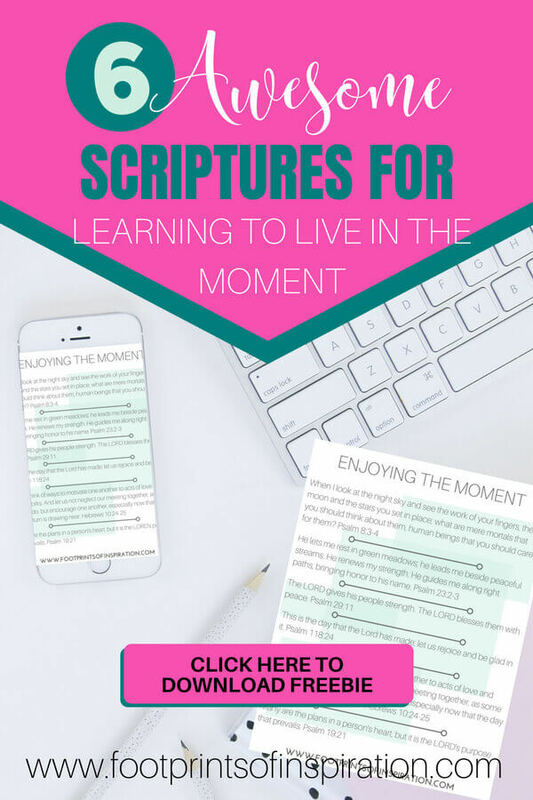 Be sure to download our FREE printable, Enjoying The Moment. You’ll find it in our subscriber library. Simply fill out the form below to subscribe to our newsletter and get instant access. 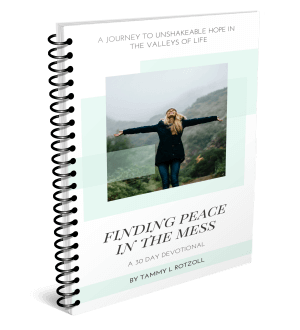 If you need more help with learning to live in the moment and stop worrying about the future and things you can not change, be sure to check out my 30-day devotional, Finding Peace in the Mess. 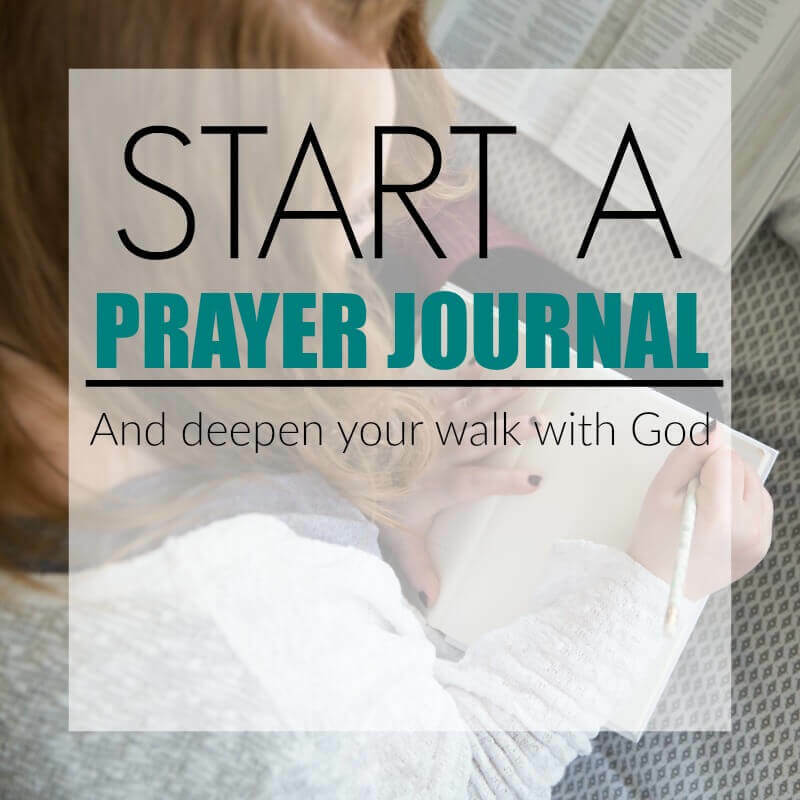 Simply click here to purchase the instant download and get started right away! Thanks for stopping by the blog today. 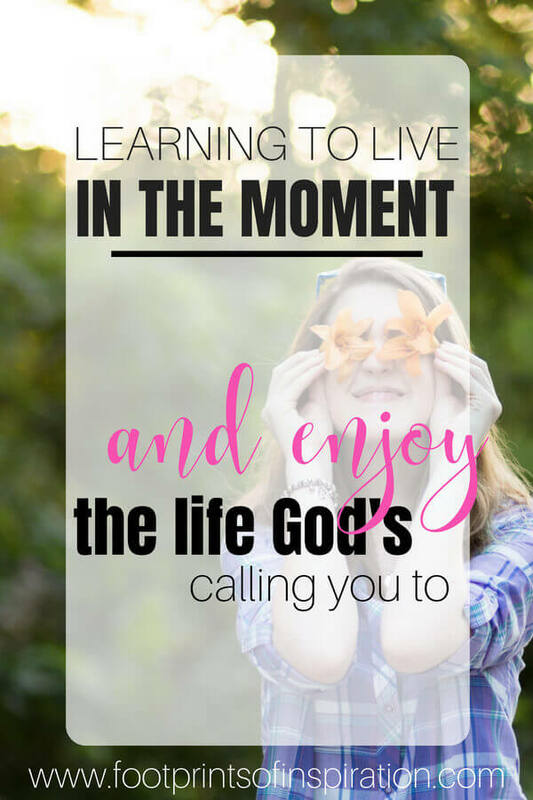 Be sure to leave me a comment below and tell me what you do to help live in the moment and enjoy this day that God has created for you! P.S. Don’t miss a single post! Sign up for our newsletter below and have them delivered right to your inbox every week. Pin this post so that you can refer back to it often! Special Note: This post may contain affiliate links. All opinions are my own. By purchasing products through these links, I may receive a small commission, however, your cost for the item does not change. For more information, see our privacy and disclaimer page. I’m a planner too and so much of this spoke right to my heart. Thank yoi! You are most welcome, Tara! It’s definitely a daily struggle for me. Thank you for stopping by the blog and taking the time to reach out!